Over the years, the technology used to create audio amplifiers has grown by leaps and bounds. We consider it our mission to use our expertise in developing the latest technologies and to bring you the absolute best sounding amplifiers on the market and of course at a reasonable price. From its clean, sleek design to its high quality components, you will be amazed at the quality and power that these new Phenom amps offer. 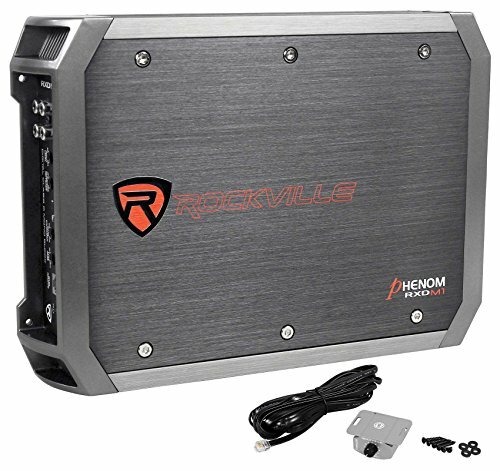 The RXD-M1 is a class D monoblock high power amplifier with 2,000 watts peak output, 1,000 watts RMS output and 500 watts CEA-2006 rated power. It is CEA-2006 compliant which makes it easy to compare this amplifier to other CEA compliant amps on the market. The issue the car audio world is facing today is that there are so many different brands with different standards on how they rate their products. Here at Rockville we offer the best value in car audio. We therefore want to make it easy for you to compare our products to any brands on the market. So we provided 3 ratings for all our car amplifiers. We provided a CEA compliant rating, which you should use to compare this amplifier to other premium brands that make CEA compliant products such as Kicker, Rockford Fosgate, Kenwood, Pioneer, etc. We also supplied an RMS rating that Is not CEA compliant but has become standard in the industry. You should use this rating when comparing with ratings from brands such as Hifonics, Earthquake, DB Drive, etc. Lastly, we also supply a peak rating which almost all brands In the industry provide. This peak power is the amount of power the amp puts out at the loudest moments during a particular song. RMS Power Ratings: (Use these RMS ratings when comparing with great brands such as Hifonics, Earthquake, Soundstream, etc) : 1 Ohm: 1000 Watts x 1 Channel. 2 Ohm 700 Watts x 1 Channel. 4 Ohm: 500 Watts x 1 Channel. Peak: (The amount of power the amplifier can produce for a split second at the loudest part of a song) : 1 Ohm: 2000 Watts x 1 Channel . 2 Ohm 1400 Watts x 1 Channel. 4 Ohm: 1000 Watts x 1 Channel. High-Speed MOSFET Power Supply. Optical Coupler Class "D" Technology. Studio-Grade Bipolar Output Stage Transistors . Now exclusively with "Professional Peak Limiter Circuitry" which guarantees distortion free musical playback at all levels. Fully Adjustable 12dB / Octave Crossover with Differential Circuitry. Low Pass Filter: 50 Hz - 250 Hz. Subsonic Filter: 15Hz - 55Hz. Phase Control Switch. Full IC-Controlled Protection Circuitry. Remote Dashboard Subwoofer Control. Fully Adjustable 12dB Bass Equalizer. Mute and Delay Soft Start System. RCA Preamp Line Output. 8 Volt Preamp Circuitry. Status Mode LED Indicator. Minimum THD at Rated Power: < 0.05%. S / N Ratio: > 100dB. Frequency Response: 10 Hz - 500 Hz. Damping Factor: > 220 @ 100 Hz. 50 Amp Maxi Fuse. Dimensions (W x H x L): 8.6" x 2.0" x 12.6" inches.